Now-a-days, Smartphones have taken over our life. They can do a ton of jobs with a simple app. And, if you are a music lover then you will not be disappointed with what we have to offer today. Smartphones have the hardware and the base Operating System. Android, on the other hand, is the leading mobile OS, consuming more than 85% of the world’s mobile OS market. With no sign of backing out, you are sure that the Android App ecosystem will survive the future. Today, we will list the best Android Music players for the music junkies out there. These music players have that simple advantage over the stock and dull music players. Music players are esthetic lovers and they are also fond of choosing a music player that have better UI and UX. So, why the wait? Let’s start listing the best Android Music players. Have iPhone? Check the Best iPhone Music Players. With so many choices out there, we start with PlayerPro Music Player. This is a robust music player with the capability of playing video files as well. So, if you are looking for a 2-in-1 player, then PlayerPro Music Player is for you. The player comes with a lot of features. Some of the major features of the players is skin support, codecs, large number of mixable audio effects, sleep timer and more. The player is currently available as a trial. If you like the trail, then you can choose to buy the player and enjoy it without any interruptions. Poweramp Music player is a top-tier music player for the Android device. It has a subtle user interface, which will be liked by a larger audience. As usual the player comes with tons of features such as graphic equalizer that has 10 band optimization, stereo expansion, dynamic cue, lots of theme support and more. The player is available for free as a trial. The trail lasts for 15 days and once it expires, you can choose to upgrade it to the premium version for a small fee. With two paid music player discussed, now its perfect time to list a free music player that stands tall in the list of best Android music player. Fusion is a completely free music player that have no advertisement of any sort. With tons of features backing up the music player, there is no doubt that you should give Fusion at least one try. It also acts as a music discovery platform and can help you organize the music in a wonderful fashion. It supports lock screen widget, powerful equalizer and more. If you are looking to amp up your music, then Equalizer is for you. 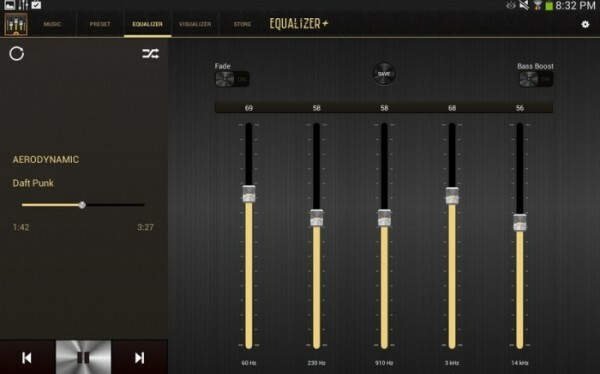 The main feature of the app is the equalizer. You can choose 5 bands and 10 equalizer presets to get started. The app also has professional sound rendering, background player mode and more.